The USS Arizona Memorial remains a focal point at Pearl Harbor. The Pearl Harbor Historic Sites partners will offer complimentary general admission to all active-duty, reserve, and retired U.S. military personnel and their dependents on Memorial Day, May 26. Qualified visitors must present a valid military ID upon entering the sites. The sites are the USS Bowfin Submarine Museum and Park, Battleship Missouri Memorial, and Pacific Aviation Museum, Pearl Harbor. The USS Arizona Memorial and recently dedicated USS Oklahoma Memorial, operated and maintained by the National Parks Service, already offer free daily admission. Memorial Day commemorates all U.S. men and women who have given their lives in military service to this country. The holiday began as a tribute to Union soldiers during the American Civil War. Following World War I, the observance was expanded to include those who died in any war or military action. 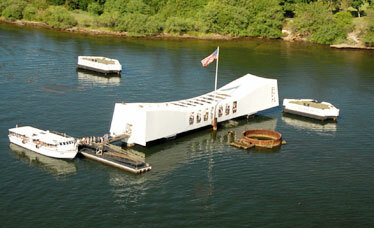 » USS Arizona Memorial: Is the final resting place for 1,177 crewmembers who lost their lives on Dec. 7, 1941. Open daily from 7:30 a.m. to 5 p.m. Tickets are issued on a first-come, first-served basis. Call 422-0561 or visit www.nps.gov/usar/d. » USS Bowfin Submarine Museum and Park: Dedicated to the sacrifice of more than 3,500 submarine personnel lost in World War II. Open daily from 8 a.m. to 5 p.m. Admission is $10 per adult and $4 per child 4-12. Military, kamaaina and school group pricing is available. Call 423-1341 or visit www.bowfin.org. » Battleship Missouri Memorial: America's last battleship completed an astounding career spanning five decades and three wars -- World War II, Korea and Operation Desert Storm -- and is best known as the site of Japan's WWII surrender. Open daily from 9 a.m. to 5 p.m. Admission is $16 per adult and $8 per child 4-12. Military, kamaaina and school group pricing is available. Call for tour reservations, (toll-free) (877)-MIGHTYMO ((877) 644-4896) or visit www.ussmissouri.org. » Pacific Aviation Museum Pearl Harbor: Gives visitors a front-row seat to the Pacific Theater in presenting aircraft and their stories. Open daily from 9 a.m. to 5 p.m. Admission is $14 per adult and $7 per child 4-12. Military, kamaaina and school group pricing is available. Call 441-1000 or visit www.pacificaviationmuseum.org. » USS Oklahoma Memorial: Created in honor of the 429 sailors and Marines lost aboard the USS Oklahoma on Dec. 7, 1941. Open daily from 7:30 a.m. to 5 p.m. Admission is free. Transportation for those without naval base access is available via the Battleship Missouri Memorial/Pacific Aviation Museum shuttle for $3 per person. Call 422-0561.